24-Hour News 8 reporter Gene Rodriguez: Let's talk about Fair Financial. You made the decision first to be on the board then you reversed that decision. Clearly the FBI was investigating him. Can you explain the red flags and why you decided to remove yourself from the board? Carl Brizzi: I never attended a board meeting, never received any compensation. Tim and I are friends and we made a decision that that was something that I wasn't going to be involved in. Gene: Now he ran your campaign and you traveled to the Super Bowl with him. Carl Brizzi: He didn't run my campaign....he was a my finance director. Gene: You traveled a lot. What does it say about your decision making when now you are learning all of this about him and you did spend a lot of time with him? Carl Brizzi: We spent almost two and a half million dollars in the 2006 campaign. It's a lot of money. And uh, Tim's a friend and he helped raise a good bit of money and also contributed a lot of money as well. And so we've spent a uh vast majority of the money that we raised prior ot 2006 on that campaign and it was a tough campaign as you remember. Both sides raised a considerable sum. Gene: You concerned about where that money came from now, knowing that you already spent it? Carl Brizzi: Well, I think it's premature to uh judge. We didn't take any money unlike another campaign recently where the candidate withdrew from the race. We didn't receive any money from Fair Holdings or from Fair Financial. Gene: However, what they are looking into is that he used those holdings as a personal bank account for some of his interests and some of his investments so arguably some of that money could have come from there and there's just no paper trail for it. Carl Brizzi: Well, I think that's why we have to wait until the investigation is over before we jump to any conclusions about...you know...maybe that if, if that money did in fact come from other sources. Gene: But you have to be concerned for your own political future, knowing what's going on and how closely related you were to him. Carl Brizzi: Tim's a friend and I am sorry that this happened, uh, to him, and you know, Gene what do you do if a friend gets in trouble you just feel badly for them. I mean that's kind of where I am at right now and we're going to go about the business of putting the bad guys in jail. Gene: Could you say that you are on the up and up and you weren't involved in any of this knowingly or anything like that. Carl Brizzi: Of course, that's not even out there is it. No one is making those kinds of accusations. So, again we all have friends and um I feel badly for what has happened to him but look we've got to go about the business of prosecuting criminals and that's where my focus is right now and this is obviously a distraction but we are going to press on. Federal prosecutors have dropped their effort to seize the assets of Indianapolis businessman Tim Durham. The U.S. Attorney's Office on Monday withdrew the request to take control of Durham's assets, including his 36,000-square-foot home along Geist Reservoir. The request was made because investigators don't think Durham is a risk. Federal investigators said Durham ran an investment scheme using one of his companies, Ohio-based Fair Financial. Investigators had originally sought to seize Durham's assets in Indiana and California in a 10-page civil complaint filed last week. The complaint accuses Durham and his associates at Akron, Ohio-based Fair Financial of telling investors their money would be invested in low-risk, high-yield short-term consumer debt. Tim Morrison, the U.S. attorney for the Southern District of Indiana, said his office had filed the case Nov. 24 to ensure Durham’s assets would not disappear. “Having [received] appropriate assurance they are not being dissipated, that litigation stopped,” said Morrison, who declined to say who provided that assurance. The short-lived case provided the first public disclosure about the case investigators are trying to build against Durham, 47, the co-owner of Akron. Ohio-based Fair Finance Co. FBI agents on Nov. 24 executed search warrants and seized records and computer equipment at Durham’s office in Chase Tower in Indianapolis and at Fair’s Akron offices, but a bureau spokeswoman would not say what agents were after. Inquiring minds want to know who intervened with Morrison to reverse the government's action? Interestingly, no attorney filed an appearance on behalf of Durham or his companies before Morrison filed his notice of dismissal today. A federal judge must still rule on the dismissal. The case has been assigned to Judge David Hamilton, who has been in the process of transferring all of his cases to other judges in order to assume his new seat on the 7th Circuit Court of Appeals. Meanwhile, the Akron Beacon Journal reports that Fair Finance's Ohio offices failed to reopen today. Worried investors gathered outside the Akron office determined to get answers about the status of their money. A former Perry Township deputy constable, Michael Sherfick, has entered a guilty plea in federal court on bribery charges arising out of the discovery by the FBI that badges and parking placards were being sold by the office of Perry Township Constable Roy Houchins. Fox 59 News' Russ McQuaid speculates that plea agreement could lead to additional charges in the case. (See video above). "Sherfick will plead guilty to one count of conspiracy and admit to accepting more than $30,000 in bribes to provide deputy constable badges, identification cards and parking placards to local business people, McQuaid reports. "A two-year-long Fox 59 News investigation has revealed that Sherfick played a significant role as a political fundraiser for republican Constable Roy Houchins and was well aquainted with campaign fundraising operations throughout Marion County," McQuaid says. Keep an eye on possible links in this case back to the Marion County Prosecutor's Office. See this earlier report by McQuaid from February, 2008. Anyone else see the irony here? There's been so much Democratic corruption in Marion County over the past several years that Carl Brizzi's office swept under the rug. Now that the feds are finally moving on local corruption, the targets are Republicans. Bartenbach operated an Internet cafe for the past eight years in Seattle before moving back to his hometown of Indianapolis earlier this year to be closer to family. He took the reins at the Damien Center in August. Before working with the disease, he was known locally for founding and operating Bartenbach grocery stores in Indianapolis from 1984 to 1993. He sold the stores as national grocery chains began coming to the city. At the same time, as a gay man, he said many of his friends were dying from AIDS. He got involved with a group that delivered food to the homes of people with HIV/AIDS. From there, he began working with other such groups. "The number of people that I have met over the years that have died . . . it seemed like we were going to a funeral weekly," Bartenbach said. "I went through a period early in life you expect to go through in old age." He said the disease has changed from his early days of service, no longer mostly restricted to gay men. Now, it's spread to minority groups such as blacks and Latinos. Fortunately, medical treatments have advanced. "When I first got into this, we had been assisting people to die in 36 months or less," he said. "Now, we're teaching them how to live for 36 years or longer." The story completely misses what the Star reported on back on October 15, 2002 about the agency that Bartenbach had run. "Indiana's only statewide organization that provides financial help to people with HIV and AIDS has mismanaged hundreds of thousands of dollars, with devastating consequences for sick people," the Star wrote then. A federal audit eventually concluded that the Indiana State Department of Health owed the US government nearly $800,000 in funds that were inappropriately distributed to about a dozen groups by AIDServe Indiana. The auditors complained that they could not find proper documentation for an additional $5.3 million and recommended that the state and the US Department of Health and Human Services continue trying to find or rebuild the paperwork to show if the money was spent correctly. Should people wonder about Bartenbach now being put in charge of the Damien Center? You bet. Timothy S. Durham, and his companies and associates, have been involved in a scheme to defraud numerous persons of money by convincing those persons to buy "investment certificates" . . . from Fair Finance Co., an Ohio company, upon the representations that the money given to buy the investment certificates will be invested in low-risk, high yield, short term consumer debts, and the investors will receive high regular interest payments on their investments. In fact, that money was not invested in the types of investments represented to investors. Instead, the money provided by victims of the scheme was used to make interest and redemption payments to earlier victims of the scheme, thereby lulling the earlier victims into believing that their money was being responsibly (sic), and enticing new investors into the scheme in order to fund payments to the earlier investors. This latest disclosure doesn't say much for the investigative prowess of our local news media in Indianapolis. Once upon a time, reporters had sources at the federal and local courthouse who could be counted on to tip them off when a case of interest got filed in their court. An Advance Indiana reader e-mailed a link to the Pacer entry for the case in the federal district of Southern Indiana. When the FBI carried out its raid of Durham's offices in the Chase Tower five days ago, reporters were only left to speculate what was transpiring. If they had simply checked court filings at the federal court house one block away, they would have known what was taking place. UPDATE: The paid media is playing catch up now. See stories now at the Indianapolis Star, the IBJ, Fox 59 News, WTHR and WISH-TV. Gee, I wonder who their source was. It now seems likely that FBI agents were prompted to conduct a raid on the Indianapolis and Akron, Ohio offices of Tim Durham's Fair Finance and Obsidian Enterprises after the IBJ's Greg Andrews expose' on how Durham was essentially using the Ohio-based finance company as a personal bank account to fund his other business endeavors. Although the FBI won't publicly state the purpose of the raid, it urged people who had business dealings with the company to contact the federal law enforcement agency. The company, which had previously sold $207 million in investment certificates, filed a request to approve a new security offering of $250 million with Ohio securities regulators following Andrews' report on Fair Finance last month. The figures are contained in a proposed offering circular Fair filed with Ohio’s Division of Securities Oct. 29. The company sought a new registration because an existing one from July 2007 was set to expire Nov. 24. He asked for additional information on a range of topics, including documentation that would help him untangle the morass of insider loans. “Please include sequential transactions on multiple levels where related parties engage in further transactions with related parties,” he said. Ronald Kaffen, an Akron attorney representing Fair, characterized the back and forth as routine. “That’s sort of standard procedure. You make a filing. You get comments back, and you respond to those comments,” Kaffen said. The company submitted its responses Nov. 24, and the Division of Securities is reviewing them. In the meantime, because Fair’s prior registration has expired, it can’t sell additional investment certificates. That could help limit losses if Fair were to fail, since new investor dollars won’t be coming in the door. But Klimek, the securities attorney, said he wonders if Fair can keep going without those infusions. A crash crunch has led Fair Finance to take a number of steps this past year that raise further concerns. It sold millions of dollars in consumer finance loans to another Durham-controlled company, CLST Holdings, which has also been the subject of litigation. A company line of credit offered by Fortress Credit Corp. has been reduced from $50 million to $35 million. The offering also indicates the company has been selling off better performing finance contracts to raise cash. Even more concerning, Fair acknowledges that it has delayed repayment of principal on maturing certificates up to 60 days because payments due to investors has exceeded 10 percent of its cash collections. Young Alumnus” by Valparaiso School of Law, and he was included from 2004 to 2009 in the Howey Political Report’s Top 50 Most Influential People in Indiana Politics. Mr. Brizzi is the father of four children. Now there's a first. Someone actually mentions in their biography that they were listed on Howey's "Top 50 Most Influential People in Indiana Politics." As you can see by the proposed offering linked to on the IBJ's site, there have been numerous additions and deletions since the original offering was proposed. Tiger Woods' early morning crash following Thanksgiving Day into a fire hydrant and a tree while leaving his Isleworth, Florida home seemed a bit strange when it was first reported. Although he was taken to a local hospital for treatment of facial lacerations, police noted that his vehicle's airbags never deployed. Police also initially indicated that his wife had broken the back window out of his Cadillac Escalade to help free him from the vehicle. Florida highway patrol officials emphasized that alcohol was not involved, though the accident remained under investigation and charges might be filed. The celebrity online gossip site, TMZ, has quite a different take on the story. It says his supermodel wife, Elin Nordegrin, had confronted him about allegations of an extramarital affair and began scratching his face. When he fled the couple's home in his Escalade, she chased after him with a golf club and began striking his car several times. This distraction may have caused Tiger to crash his vehicle according to TMZ. The online gossip magazine also says Tiger was taking a prescription pain medication at the time of the accident for another injury to explain why he appeared out of it at the time of the accident. Business partner David Tornek has a 4 bedroom, 4 bath, 5700 square foot home in Cherry Hills Village, Colorado listed for sale at $2,600,000 with realtor Ann Kerr. Fair Finance partner James Cochran has a 6 bedroom, 6 bath, 8700 square foot home in McCordsville, Indiana listed for sale at $1,299,999 with Dunville & Associates. Business associate Shannon Frantz has a 4 bedroom, 3 1/2 bath, 4935 square foot home in Indianapolis listed for sale at $629,000 with realtor Paul Bates. Some of you may recall that Frantz is the blonde-haired, female companion that appeared in a photo with Durham, Carl Brizzi, Peyton Manning, Eli Manning and Archie Manning taken in the Bahamas after the Colts' Super Bowl win in Miami. In light of the recent investigations concerning the non-campaign-related business affairs of my campaign finance chairman, I have made the decision that it is appropriate to return any and all financial contributions and loans that my campaign has received from him or his affiliated businesses. Mr. Durham recently asked me to serve on the Board of one of his companies, Fair Financial. While I initially accepted the position, I never attended a meeting of the Board, never voted as a Board member, was never involved in any of the business decisions of Fair Financial, and was never compensated as a member of the Board. Upon reading the October IBJ article and uncertain whether I had yet formally taken a position on the Board, I indicated to Mr. Durham that I was no longer interested in serving on the Board. WISH-TV's Jim Shallow takes a number of other Republican officials to task for accepting political contributions from Durham, including Gov. Mitch Daniels, Sen. Richard Lugar, Attorney General Greg Zoeller, State Treasurer Richard Mourdock, House Republican Leader Brian Bosma and Sen. Mike Delph. Interestingly, this same political reporter ignored $25,000 in contributions U.S. Rep. Andre Carson (D-Indianapolis) accepted from Marla and Phyllis Stevens, who allegedly stole about $6 million from Aviva. His report says nothing about Democratic mayoral hopeful Brian Williams' past business ties to Durham. Williams was a co-founder of Obsidian Enterprises and served on its board. Although his resume has listed his relationship with Durham's company's, he quickly began contacting people yesterday, including this blogger, to distance himself from Durham. Shallow's report notes only one Democrat who received money from Durham. That would be U.S. Rep. Baron Hill. Both Hill and Durham grew up in Seymour. Daniels has received the most campaign money from Durham of any candidate at $200,000. Unfortunately, many GOP candidates were encouraged by party officials to accept financial help from Durham despite plenty of warning signs that he was living far too extravagant of a lifestyle and had a number of legal disputes involving people with whom he did business. Candidates like Mike Delph had no knowledge of who Durham was until he ran for public office and accepted his contributions because party leaders touted him so highly. He plans to give up the money he received from Durham if the federal investigation reveals that Durham's money may have been the product of ill-gotten gains. The Marion County Republican Party asked Durham to host an annual holiday party at his expansive Geist mansion. Republican members of the City-County Council actually held their caucus to elect their leadership after the 2007 election at Durham's private offices atop the Chase Tower. Those same candidates will now have to cope with purging themselves with hundreds of thousands of dollars Durham gave them if this investigation ends where it appears to be headed. There is news that Durham has links to the corruption case involving two Henry County law enforcement officers who are facing charges of ghost employment. Durham is listed as a witness for the state in that case according to WRTV's Rafael Sanchez. The two police officers involved in that criminal prosecution may have provided off-duty security work at lavish parties Durham put on at his Geist mansion. Those two police officers are represented by the same criminal defense attorney who is representing Durham, Indianapolis attorney John Tompkins. People might be asking if these two officers worked for the private security company owned by former Marion Co. Sheriff Jack Cottey, who is also tied to Tim Motsinger. Did Cottey's firm staff those parties? There was a story circulating around town awhile back about FBI agents being staked outside Durham's residence taking down the license plate numbers of all of the guests at one of his parties. Meanwhile, there is even more fallout in Ohio where Fair Finance is headquartered. Congressman John Boccieri (D-OH) put out a statement asking the federal government to seize the assets of Durham and Fair Finance. The Akron Beacon Journal describes the offices of Fair Finance as "emptied" after the FBI's raid on Tuesday. It also notes the decision of Ohio securities regulators to put on hold a pending $250 million security offering by the company. That means the company can no longer sell securities in Ohio since an earlier offering by the company matured this past week. "The company routinely advertised consumer financial products that paid high interest rates and were not federally insured," the paper reports. Investors there worry that their investments with the company may be lost. Marion County Prosecutor Carl Brizzi said he agreed this fall to serve on the board of Tim Durham’s Fair Finance Co., but changed his mind several weeks later after Durham told him IBJ was working on an investigative story about the company. “The whole point of being on the board was to get an education on how this stuff works,” Brizzi said Tuesday morning, several hours before FBI agents conducted a surprise raid on Fair’s Akron headquarters and the headquarters of Obsidian Enterprises, Durham’s Indianapolis-based leveraged-buyout firm. Brizzi said that Durham told him, “This stuff is going on. You probably don’t need to be in the middle of all this.” . . .
Brizzi said had agreed to serve on the board because he was interested in learning more about finance from Durham, whom he described as “a buddy.” Durham also has been a major campaign contributor to Brizzi, who is in his second term as prosecutor. Campaign finance records show that Durham and his companies have donated more than $200,000 to Brizzi campaigns. Brizzi, a Republican, would have served as one of Fair’s independent directors. One of the duties of independent directors is to decide whether to approve loans to Durham and other insiders. Brizzi acknowledged he wouldn’t have been ideal for that role. “If you are relying on your friends to educate you along the way, you probably are not as independent as you should be,” Brizzi said. A source tells Advance Indiana that Brizzi's name actually appeared on Fair Finance documents listing him as a board member before he withdrew from the board. The Star's John Russell confirms company documents filed with Ohio regulators in October list Brizzi as a board member. "Brizzi was elected earlier this year as a director of Fair Financial, based in Akron, Ohio, according to a list of board members described in the company's recent filing with the Ohio Department of Commerce to sell $250 million in certificates of deposit," Russell reports. Russell's report seems to contradict Brizzi's comments to the IBJ's Andrews. Brizzi did not return calls to the Star responding to questions about his role on the board. Many concerned people have raised questions about the business relationship Brizzi has with Durham. In order to clear the air, Brizzi should fully disclose the entirety of his business relationships now. Durham and his companies are now facing the scrutiny of the FBI, which raided his offices in Indianapolis and Akron, Ohio yesterday. Questions have been raised about Durham's use of Fair Finance to bankroll his other business activities. At stake is at least $200 million investors have made in the company. A debt of $168 million owed by Durham-related companies to Fair Finance that has matured now appears in debt. Ohio regulators have held up approving a new security offering of Fair Finance until the company answers questioned posed by regulators. The photo above depicts a "Closed" sign on the door of Fair Finance's Wooster, Ohio office. A notice in the window said a new office location will be announced. 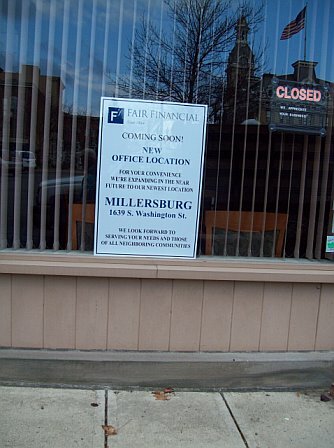 Customers are referred to an office in Millersburg, Ohio. Fox 59 News is reporting that the FBI has taken Tim Durham into custody for questioning in Los Angeles today. See video above. Fox 59 News describes his business empire as being in a state of collapse. The report indicates that the feds visited restaurants owned by Durham prior to today in search of incriminating evidence. Fox 59 News attempted to obtain a reaction from one of Durham's closest friends, Marion Co. Prosecutor Carl Brizzi, who did not respond to press inquiries on the matter. If you have information about any of Durham's business activities that you would like to report to the FBI, call 1-800-CALL FBI. Advance Indiana understands that members of Ohio's Amish community may be the unlikely victims here as investors in Fair Finance. The high interest certificates of investment offered by the company were enticing to some investors, but they are not insured deposits like a bank offers. UPDATE: A criminal defense attorney for Durham, John Tompkins, confirms that Durham was questioned by FBI agents in LA yesterday, but he says he was never taken into custody as suggested by Fox 59 News' report last night. Watch the local politicians start running for cover. The FBI raided the offices of one of their biggest benefactors, Indianapolis business tycoon Tim Durham, this afternoon. FBI agents began carting off files from Durham's top floor offices in the Chase Tower. A separate raid took place in Akron, Ohio where Fair Finance has an office. They're investigating Durham's Ohio-based Fair Finance Company and Obsidian Enterprises. FBI agents are remaining mum about the purpose behind the execution of search warrants on Durham's business today. This Advance Indiana entry on an IBJ expose' by Greg Andrews last month will give you a pretty good indication of what federal agents are investigating. See also the following possible related entries here and here. According to a recent filing with Ohio securities regulators, Durham's Fair Finance proposed a new securities offering that raised a lot of red flags in light of the IBJ report. Ohio security regulators have been dragging their feet on taking action to protect investors despite ample warning signs conveyed to them by interested parties; however, Ohio officials are holding up approval of this latest offering until questions are answered. That may set off a chain reaction as Durham's company may have desparately needed those new funds to pay off old debts. Durham is shown above at a lavish Halloween Party he recently hosted at his new Hollywood mansion for National Lampoon, another one of his company's that has faced securities fraud allegations. Durham is dressed up as the Mad Hatter character from "Alice In Wonderland." The IBJ has an online update on this developing story here. Political fallout analysis: No politician is closer to Tim Durham than Marion Co. Prosecutor Carl Brizzi. New disclosures of the extent of that relationship that will emerge in the coming days will probably end his political career. Durham recently hosted a fundraiser for Marion Co. GOP sheriff candidate Tim Motsinger. Aspiring Democratic mayoral hopeful, Brian Williams, is a founding member and sat on the board of Obsidian Enterprises. Reporters may soon begin asking some local politicians "what do you know and when did you know it?" Look for campaigns to begin purging themselves of Durham campaign contributions in short order. Brizzi has pocketed more than $150,000 in campaign contributions from Durham. There isn't a campaign promise Greg Ballard won't break. Since becoming mayor of Indianapolis, Ballard has basically been conducting a public auction selling off the City to the highest bidders. This is once again reflected in the opportunity he passed up to clean up the corrupt Capital Improvement Board. Instead of appointing independent-thinking people who put the taxpayers' interests ahead of their own self-interests to the CIB, Ballard has announced a group of new appointees that is teaming with conflicts. Ballard will replace the board's president, Bob Grand, whose law firm represented the Simons and their Indiana Pacers, with the Board's current treasurer, Ann Lathrop. She works for Crowe Horwath, a CPA consulting firm that relies heavily on government contracts. Because she is a former city controller and has strong political ties to people in government, she was hired by the Crowe Horwath (see water company deal) to help land new business for the firm through her political connections. The list of remaining appointees don't get much better than Lathrop. Outgoing Chief of Staff Paul Okeson, who has just taken a job with a major city contractor and big political contributor, Keystone Construction, will be taking a seat on the board. Jim Dora, Jr. is a big hotel operator who just happens to own a hotel directly across the street from Lucas Oil Stadium. Carolene Mays, a Democrat, is the sister of businessman Bill Mays of 300 East infamy (the bar in the Julia Carson Government Center), the same brother who was recently tied to an insider trading scandal during the acquisition of a local bank on whose board he served. Carolene operates the Indianapolis Recorder, which her brother owns, a newspaper that serves the City's African-American community. Her newspaper went with the meme that guys like Monroe Gray and Ron Gibson were under attack because they were African-American; it had nothing to do with their public behavior and actions. Since when did we start putting newspaper publishers on public boards? Ballard is reappointing Jay Potesta, a union boss for the Sheet Metal Workers union. Potesta's day job is to make sure as much of your taxpayer dollars as possible gets invested in public works projects that will employ his fellow union members at top dollar wages. He could give a damn less about the taxpayers' wallets. Ballard is also appointing David Shane, CEO of LDI, Ltd., a firm founded and chaired by businessman Andre Lacy. He previously served as an education adviser to Gov. Mitch Daniels. Shane is perhaps the only new appointee who might be capable of exercising independent judgment on the board. If you had any doubt about Ballard's intentions, these latest round of appointees should leave no doubt in your mind. The guy is all about following the orders handed to him by a small group of elitist insiders who are all about lining their pockets at taxpayers expense. They throw Ballard free memberships to country clubs, treat him to expensive dinners, fill up his campaign coffers and take him on overseas junkets, and he's all too happy to turn over the City's checkbook to them to enjoy as they please. What a sell out of the first order. More on "Pay to Play is the Ballard Way." Mayor Greg Ballard's Chief of Staff Paul Okeson has announced his resignation to take a job with Keystone Construction, another major city contractor that has contributed large sums to Ballard's campaign committee. Okeson told WTHR he couldn't afford to raise a family on the lowly pay of a Chief of Staff. Before joining the Ballard administration, Okeson worked as a government relations consultant for Bernardin, Lochmueller and Associates, another major city contractor. Okeson will be replaced by Corporation Counsel Chris Cotterill. Coincidentally, Ersal Ozdemir of Keystone Construction accompanied Mayor Ballard on his junket to Europe this past week. I'm sure there's no connection between Okeson's new job, city contracts and political contributions. The Mayor's office expects to make more staff change announcements at a press conference tomorrow. Six new appointments to the Capital Improvement Board are expected to be made. •Former town clerk-treasurer and town manager Christopher Parrish. The lawsuit alleges Parrish paid himself $31,535.91 in fictitious travel expenses and approved phony claims and improperly issued reimbursement checks for four other defendants. Parrish resigned from his town positions in January 2009. •Former town marshal James Kimm. The complaint alleges Kimm submitted falsified mileage reimbursement claims to Parrish for destinations to which he didn’t travel and was paid $52,553.06. He also allegedly received $1,700 in petty cash reimbursements from Parrish. The State Board of Accounts audit noted that Kimm’s description for most of the out-of-state travel was to pick up military surplus from the U.S. Defense Reutilization and Marketing Office. When examiners checked with the DRMO, they reportedly found no record of anyone from Chesterfield, including Kimm, obtaining equipment from a DRMO location, the audit said. Kimm resigned as town marshal in January 2009. •Joseph Brown, a former part-time police officer for Chesterfield who is half-brother of Kimm. The lawsuit alleges Brown participated in a scheme with Parrish and Kimm where Brown submitted phony claims for automotive repairs to town-owned vehicles that never were performed. The State Board of Accounts examiners reported that the street address of “Brown’s Automotive” listed on the invoices is a home in a residential neighborhood where there was no indication of commercial automotive work taking place. Brown received 24 checks totaling $115,391.44 between January 2007 and March 2008, the audit found. •Christopher Walters, a former town maintenance superintendent, and his brother James Walters, a former town maintenance employee. The suit alleges the two former employees were part of a scheme with Parrish where they were paid $37,600 for repair work to town government buildings that never occurred, according to the audit. The suit alleges James Walters owes $13,002.88 for hours he was paid but didn’t work and owes $2,850 for tools improperly purchased with town funds. Christopher Walters allegedly was overpaid by $4,992.76 for hours he didn’t work. Not surprisingly, Chesterfield's Town Council had no idea the employees were defrauding the municipal government before the State Board of Accounts released its audit. Libri said he learned of Dennison's death when Chicago police knocked on his door at about 9 a.m., asking him to identify the body. Libri had few details of the case, but said he didn't suspect foul play or suicide. "I had dinner with him last night and he was fine. He wasn't depressed," Libri said. Dennison had worked with him since 1996 and is survived by his wife and three children. "He's my employee but he's one of my close friends," he said. "He was a great guy." Libri says he doesn't suspect foul play or suicide. At least three Chicago political insiders under investigation have allegedly committed suicide over the past two years. Did he decide to go for a swim in Lake Michigan this time of the year? The State Journal-Register says Dennison, a 40-year-old, may have slipped and fallen into the lake and drowned or had a heart attack. He was found early this morning wearing the same clothes he was wearing when he and Libri dined the evening before. Dennison also worked part-time for a local radio station according to the Journal-Register. When I lived in Springfield back in the 1980s, Libri worked as a weatherman for WICS, a local NBC television affiliate in Springfield. I recall having fun with my roommate and his fiance' poking fun at him during his weather broadcasts. Later, my roommate's girlfriend broke off their engagement and wound up marrying Libri. Ouch! I always wondered what made her change her opinion of him. Libri is the current Sangamon Co. GOP Chairman and a very close political associate of William Cellini, a wealthy businessman and big-time political insider who is currently facing indictment on public corruption charges arising out of the awarding of state pension investment contracts in Illinois under former Gov. Rod Blagojevich. Okay, That's a good question. The uh. I really felt like the city was, uh, going in the wrong direction, and I just thought we could do a better job than what we were doing. That's really pretty much it. I, uh, do this not for me. I'm very candid about this. I spent 23 years in the Marine Corps. This is strictly public service to me. That's all it is. There is no ego in this for me. I'm just trying to do the right thing here for the city. I thought we could do a little bit better. I thought spending was out of control. I thought crime was up. That sort of thing. I thought we can do better. I think so far that's proven to be true. Spending is under control, crime is down and that sort of thing. I decided that. It's a strange set of circumstances when I did that. It was in the spring of 2007. I had just a couple of people asking me you need to look at that--look at running for mayor. I had something else in mind. I knew I was going to do public service again after the Marine Corps. My kids were growing up. It's time to go do something and the opportunity arose after a strange set of circumstances in the spring of 2007, that I won't necessarily go into--it might take 10 minutes to go through all of that but through a set of circumstances I was able to get the nomination and win the election. "A strange set of circumstances?" I'll say. By the way, Greg "I'll end country club politics in Indianapolis" Ballard is throwing another fundraiser hosted by Hunt Construction Co. and Riley Bennett & Egloff law firm, both major contractors with the City of Indianapolis. So much for campaign promises to clean up city government. Pay to play is the Ballard way. His crack team of advisers are holding a press conference today at the scene of the latest murder in the City to reassure people in the near southside neighborhood while the Mayor is on his latest junket to Europe. Shawn Clements loves showing off the Dunham house, a 19th century farmhouse that he purchased in 2004 with the idea of preserving it so that he could live here. When a neighbor told him to research the home's ownership he got big surprise. He found a copy of a land grant that shows the property was settled by Jacob Dunham in 1840. Jacob Dunham was Barack Obama's great-great-great-great grandfather. He is one of 11 Obama ancestors buried in the Kempton Cemetery. And when word of the research got back to Barack Obama, he came to a potluck dinner at the Dunham home just days before the 2008 May primary election. Clements later got tickets to the Obama Inauguration and to an inaugural ball. "This stopped being my house a while back," said Clements. Let's not forget this is on Obama's mother's side of the family. Remember, that would be the mother he hated so much that he wouldn't take the time to visit her in her hospital room when she was dying from cervical cancer. "I ceased to advertise my mother's race at the age of 12 or 13, when I began to suspect that by doing so I was ingratiating myself to whites," Obama wrote in his autobiography, "Dreams From My Father". "I found a solace in nursing a pervasive sense of grievance and animosity against my mother's race," he continued. I guess it's easy enough for Obama to visit the former homes of his dead white relatives when it is politically expedient to do so. This home has absolutely no significant historical value to Hoosiers or Americans despite Clements' feeble attempt to draw attention to it. Nobody remotely close to Obama lived in that home during his lifetime. We learn nothing about Obama from this home. At least with the James Whitcomb Riley home in my neighborhood of Lockerbie they can claim he occasionally slept in the home owned by a family friend, although Riley never actually owned the home or lived there for any extended period. Rather than looking for history in some distant relative who lived long before him, some of us would simply settle on learning where Obama was born. His family can't seem to agree on which hospital in Honolulu his mother gave birth to him. If Barry would simply release his original birth certificate, we could put that to rest and we could mount the plaque recognizing his birth place in its appropriate place. You can bet that will continue to remain a mystery just like his school records. How many millions of dollars will Barry spend on attorneys' fees before it's all over to prevent anyone from discovering anything about his life story other than the lies terrorist Bill Ayers wrote for him in his so-called autobiography, "Dreams From My Father." Get that? Dreams from a father who walked out on his life when he was two and never came back. UPDATE: It looks like the federal government is making Billy Carter's gas station down in Plains, Georgia a historic landmark that will be maintained by federal taxpayers. The cost is expected to be $17 million over the next five years. Unbelievable. One of the most outrageous assertions I've heard coming from Indianapolis officials on a task force looking at the Capital Improvement Board's financial woes is that the problem lies in the suburban counties surrounding Marion County not paying their fair share for the sports stadiums and convention center. What are these people smoking? State and regional taxpayers have poured tens of millions of dollars annually into this county to support these facilities. The state created a special taxing district several years ago that diverts general revenue funds into a fund to pay off the bonds on Lucas Oil Stadium and the Indiana Convention Center expansion, which it expanded in size just this year. Residents of Boone, Hamilton, Hancock, Hendricks and Shelby Counties are paying a food and beverage tax to pay for Lucas Oil Stadium and the convention center expansion. Following these self-interested Indianapolis officials' assertion through to its logical conclusion, I guess the rest of the state's residents should be demanding a share of the revenues generated to Indianapolis' economy because the center of state government is based here with all of those jobs and spending related thereto. The notion that suburban taxpayers aren't paying their fair share is absurd. If you want to feed the corrupt inner city monster, then move to Chicago. Suburban taxpayers in Illinois have fed the Chicago and Cook County government monsters billions over the years and the demand for even more never ceases. Wake up, suburban counties, unless you want to be tapped even more to feed this monster called the Capital Improvement Board. And if you think it will stop there, think again. They've got more plans in the works to tax you for the benefit of crossing the county line into Marion County. The CIB is not your problem. Don't let them convince you that it is. "Regionalism" is just a euphemism for getting other people to pay for our out-of-control spending in Marion County. "Why shouldn't (the council) just blow this whole thing up?" the Star quotes City-County Councilor Ben Hunter, chairman of the Public Works Committee as saying during yesterday's meeting on the subject of the water company's 35% rate increase request. "You keep coming back and asking for more rate increases. Come back to me and tell me the efficiencies." The answer to Hunter's question is "yes." You should blow this whole deal up and stop the payoffs to the political cronies who cooked it up in the first place. Candidate Greg Ballard promised to get to the bottom of the one-sided privatization agreement that allows Veolia to pocket about $50 million annually for operating the water company. That deal was brokered by the administration of Bart Peterson. City residents were told the water company purchase was necessary to prevent the company from falling into the hands of a foreign owner and to protect the pay and benefits of the utility's employees. After paying more than double what the company was actually worth, Peterson handed over control of the utility to the French company, which then cut benefits to the long-time employees of the utility. The one-sided deal has proven very costly to ratepayers, but it has financially rewarded lobbyists and cronies of Mayor Peterson who cooked up the deal. In another scheme, Mayor Peterson put more money in his cronies' pockets by exchanging the utility's fixed rate bonds with risky variable rate bonds from which it cost about $50 million in penalties to extricate itself. Instead of renegotiating the one-sided deal after taking office and calling for a top-to-bottom investigation of what transpired under Peterson, Mayor Ballard took up where Peterson left off and hopped in bed with the contractors and lobbyists, even enhancing payments to Veolia at the same time we've seen water rates nearly double. Ballard is now looking for a way to sell the utility to a public benefit corporation like Citizens Gas & Coke. His plan, however, calls for jacking rates even higher to ensure higher profits to the potential buyer. Ballard then wants to use the proceeds from the sale to finance a bunch of capital projects being pushed by city contractors who have put close to $2 million in his campaign war chest. It would be nice if there was at least one actor in this process who acted in the interests of the City's residents and not themselves and their political cronies. This is Indianapolis though. What else should be expect, right? A federal grand jury in Des Moines, Iowa has returned a four-count indictment against Marla Stevens in connection with the embezzlement of nearly $6 million from Aviva by her spouse, Phyllis Stevens, a long-time employee of the company. The Des Moines Register reports that Marla has been charged with conspiracy to commit one count of money laundering and three counts of participating in financial transactions with money derived from a criminal transaction. The couple has been active in GLBT politics in Iowa and in Indiana where they lived until five years ago and have contributed more than $175,000 to political candidates, including at least $25,000 to U.S. Rep. Andre Carson (D) and another $8,000 to his grandmother, the late U.S. Rep. Julia Carson. Phyllis Stevens has been jailed since she was picked up by FBI agents last month in Las Vegas. A federal judge has approved her release pending trial, but she has not yet filed the $75,000 cash bond required by the court. Phyllis fled to Las Vegas after her employer confronted her with the allegations and after she attempted unsuccessfully to withdraw $175,000 cash from the couple's joint account at National City Bank branches in Indianapolis. Marla Stevens had been living at the Bellagio Hotel for months where she reportedly ran up $2 million in charges. UPDATE: Phyllis Stevens has been released from jail after posting a $75,000 cash bond. Marla Stevens was released without bail after entering a not guilty plea with a federal magistrate. U.S. District Court Judge David Hamilton has just been confirmed for a seat on the Seventh Circuit Court of Appeals by the U.S. Senate on a vote of 59-39 vote per the Indiana Law Blog. Here's the roll call vote. Sen. Richard Lugar (R-IN) was the only Republican who voted in favor of Hamilton's confirmation. Sens. Max Baucus (D-MT) and Robert Byrd (D-WV) did not vote. One of the four candidates rumored to be under consideration for Public Safety Director in Indianapolis, White Plains New York Public Safety Commissioner Frank Straub, resigned his job there late last week. The White Plains city council had planned to fire him at a special meeting scheduled for Monday according to The Journal News. Straub had been feuding with the council over work schedules for police and firefighters that the city negotiated with the unions, and that Straub claimed had saved the city over $400,000 in overtime pay and 2,600 hours of sick time. Other candidates for the vacant Indianapolis Public Safety position include interim Public Safety Director Mark Renner, IMPD Chief Michael Spears and Darryl Pierce. Charlene Lugar has been released from the county’s detention facility, according to his office. The Star has a brief story online here. While we're on the subject of DUIs, Sen. John Kerry's daughter, Alexandra, was busted on a DUI charge in Hollywood early this morning. The costs of Indianapolis' downtown cultural trail have skyrocketed, now approaching $55 million. Over $28 million of the costs have been absorbed by private donations, including a $15 million donation from Gene and Marilyn Glick. A federal transportation grant has provided another $14.4 million of the funding to date. Another $13 million, however, is needed to complete the project as envisioned in time for the Super Bowl in 2012 according to a WRTV report. As a downtown resident, I enjoy the benefits that the cultural trail brings to my neighborhood, but it does seem a bit extravagant. I know some businesses along Mass Avenue are extremely upset at the disruption of traffic the drawn-out project has caused and the resulting loss of business. It will be a great boon to them when it's completed, if they can survive that long. The amenities it offers are very nice, but the cost of maintaining it once it is completed could prove problematic in future years. Earlier this year, Democrats promised America that the unprecedented level of spending in the federal stimulus bill would be administered with the highest level of accountability and transparency. Despite their promises, errors and dubious account abound. This week we have learned that over $5 million of stimulus funds were reported as having been spent in Indiana Congressional Districts 00, 10, 11, 14 and 18, districts that do not exist." "Reps. Joe Donnelly and Baron Hill voted for the so-called stimulus and its massive spending increases. What's troubling is that it continues to fall short of what the Democrats in Washington told the country. The reporting errors are an underlying symptom of the larger problem. As such, Reps. Donnelly and Hill owe an explanation to Hoosiers." "Well, I think President Obama should know that somebody has messed with Joe. The imaginary 00, 10th, 11th, 14th, and 18th Congressional Districts of Indiana have, according to recovery.gov, made a tax dollar windfall of about $5.3 million, and 'created or saved' 9 jobs - all of which obviously can't exist in these fake districts. "From the beginning, I said this program would be exposed to rampant waste, fraud, and abuse. Now, as we see these magical numbers from the Obama Administration, how can we ever be convinced that this money will be accounted for and given proper oversight? The answer is simply this: we can't. "It's time to pack up this program, save the President from further embarrassments, use the remaining funds to pay down the debt and deficits, and cut taxes on capital gains, small businesses, and individuals so we can be 100% sure the money is used to create real jobs in real Congressional Districts. Fox59 News has learned IMPD has been rejected for a $1.7 million dollar grant to buy 50 new police cars. And, it appears more advance discussion with Indiana Criminal Justice Institute officials about restrictions for equipment would have let city leaders learn months ago they never had a chance to get grant money for cars. "The equipment grants we give out are typically for $10,000 or less," said Neil Moore, executive director of the Justice Institute. "If you look at what we funded in the past you will see we don't fund cars for large police agencies." IMPD was requesting $1.3 million for cars. The total request was $1.7 million dollars. The money is needed to match Federal money the city's taking to cover salaries for 50 new police officers in 2010. By taking the federal money the city has to guarantee it can buy equipment for the new police and cover their salaries after three years. "We were a little surprised, we were counting on it," said Valerie Washington, CFO for public safety. Grant papers obtained by Fox59 News say the city is in a current "tax crisis" and is 18 months behind in collecting taxes. The city also asked for line items including $70,000 for 50 new police uniforms, $179,000 for 50 handheld radios, $140,00 for firearm training, $10,000 for training material, and $3,950 for 50 pagers for recruits. The entire grant was rejected about three weeks ago. "Since then we've been working with the controller's office, the grant unit to find alternative funding sources," said Washington. She also said the grant writers had consulted with someone at the ICJI about the requests for equipment. City officials say the federal grant description did cover allotments for cars. But Moore says local police agencies like IMPD know the Institute's history and rejection of funding for police cars. "We only provide one or two cars for very small police departments in need," said Moore. Discoveries like this will tell us whether the City-County Council actually approved a balanced budget for 2010 as advertised. The City claims it expects to have a $15 million surplus next year. I would point out that the 2007 65%, $90 million a year increase in the local income tax was supposed to include funding for 100 new police officers that had never been funded as promised earlier in his administration of then-Mayor Bart Peterson. Mayor Greg Ballard, simiilarly, didn't used those additional income tax revenues to fill 100 new positions. Instead, he is filling half of those positions using one-time federal grant money. How will we pay for those positions when the federal grant money is exhausted? We obviously don't even have the funding to purchase their police cars, uniforms, etc. This is why City-County Councilors should do a more thorough job scrutinizing the budgets presented to them and not simply rubber stamp what has been put in front of them by the Controller's Office. The mother of a nearly one-year-old child found wandering a busy street now faces criminal charges. Neighbors found the toddler walking on a sidewalk at 21st and Harding Saturday night. It took police over 24 hours to find her mother, 38-year-old Tuesday House. A busy Indianapolis street after dark is where a little girl ended up after police say she was left alone. "Mom left to go out, believed a friend of the family was there to watch the baby who was sleeping," said Sgt. Matt Mount, IMPD. It was neighbors who noticed the toddler walking and crawling on a sidewalk along Harding street near 21st at about 8:00 pm Saturday night. They took her to a nearby store and called for help. "We was knocking on every door trying to see whose baby it was," said Jimmie Cushingberry, witness. But it wasn't until news reports showed the girl's picture that family members came forward. Uncle Eric Cosby, who said the little girl often stays at his home, was surprised to find she was missing. He chalks it up to a big misunderstanding . . . Early Monday afternoon, an interview with the girl's mother led to charges against her when she admitted to drinking and using cocaine the night her daughter wandered off. Tuesday House told detectives when she left the house, a family friend was outside and the baby was asleep inside. But detectives say no arrangements were made to take care of the young girl . . .
House works for the Indiana Family and Social Services Agency as a clerk, although she is employed through a temp agency. According to the WTHR report, House had been hired by a private contractor to work at FSSA. House was hired by Alpha Rae, a temporary employment agency used by FSSA to fill clerical positions. Seventh District Republican congressional candidate Carlos May criticized U.S. Rep. Andre Carson's recent suggestion in an Associated Press interview following the Ft. Hood attack by Maj. Nidal Hasan that left 12 Army soldiers and one civilian dead that the focus should be on Hasan's "mental health issues." "This is no way a reflection of Islam any more than Timothy McVeigh's actions are a reflection of Christianity," Carson told the AP. May called Carson's linkage of McVeigh and Hasan "misleading and irresponsible." While May rejected "any linkage between murder and Islam", he said he was troubled that Carson dismissed any connection between Hasan's actions and his religion. "However, for Carson to dismiss the facts pointing to Hasan’s associations with Anwar al-Awlaki, a radical cleric who knew three of the 9/11 hijackers, and Hasan’s association with him going back to 2001 as mere mental illness is troubling," May said. "Carson is representing the twelfth largest city in the U.S., and is a former employee of IDHS who should be leading the effort for a thorough Congressional investigation." It's refreshing to see a politician speak candidly on this issue. Virtually all of Indiana's congressional delegation and congressional candidates have remained silent on the Ft. Hood terrorist attack, seemingly afraid to speak their mind for fear of being labeled as "anti Muslim." The silence from our two Indiana senators, Richard Lugar and Evan Bayh, has been deafening. The deranged Fort Hood gunman - accused of killing 13 people and wounding 29 others - snapped after being dumped by a lover, The ENQUIRER has learned exclusively. Authorities say Maj. Nidal Malik Hasan - an American-born Muslim of Palestinian descent - became deeply disturbed over his imminent deployment to Afghanistan. But his final decline into madness was triggered by his miserable failure at romance. While the investigation is being kept under tight wraps, a top government source, close to the case, told The ENQUIRER: "There's evidence he was dumped by a lover." The ENQUIRER has also learned the 39-year-old Army psychiatrist had a deep-seated inability to deal with women that stemmed all the way back to high school - and he may have had homosexual relationships. "Hasan had someone he was seeing - a woman or even a man - or may have imagined the love affair," disclosed the government source. "It's quite possible the object of his affection had no idea they were Hasan's love interest. "What's clear is that Hasan felt he was dumped by this person, giving him another reason for unleashing his mass assault. In his sick mind, Hasan may have believed that one of these innocent men he gunned down stole away his lover." . . .
Imam Mohamed Abdullahi, who runs the Muslim Community Center in Silver Spring, Md., where the psychiatrist attended prayer services, told The ENQUIRER Hasan may have been confused about his sexuality. "Maybe he is a homosexual. He was clearly very troubled. In the Koran, there was a messenger who was a homosexual, and God destroyed him." Among Hasan's belongings, confiscated by police at his apartment, was a cache of HIV prescription drugs. Oh, the irony that people within government would now be attempting to portray Hasan as a mentally unstable gay men who is a HIV-positive. If Hasan had simply told his Army superiors he was gay, he would have been discharged in a heartbeat under the military's "Don't Ask, Don't Tell policy. Earlier this year, the Army discharged 11 gay soldiers because of the policy. A West Point graduate, Dan Choi, received notice in May of this year that he would be discharged from the Army National Guard for speaking out about his homosexuality in a television interview. Choi spoke Arabic fluently and had recently completed a tour of duty in Iraq. More than 12,000 soldiers have been dismissed since President Clinton signed into law the Don't Ask, Don't Tell law in 1993. It's pretty sad that our military would view a soldier like Choi as a risk to the morale and well-being of his fellow soldiers, while turning a blind eye to Hasan's outrageous anti-American statements and praise of Islamic suicide bombers. The 60-year-old Scott, Mayor Daley’s go-to-guy for years, had a gunshot wound to his left temple. He left behind his cell phone on a ledge overlooking the river on the west side of the Apparel Center, 350 N. Orleans. But he left no note, a source said . . .
“No, no. None whatsoever,” Daley said when asked if he sensed Scott was struggling with personal issues. “Mike was always helping people with troubles" . . .
Scott was Daley’s long-time go-to guy but raised eyebrows earlier this year when he disclosed to the Sun-Times that he had been subpoenaed by a federal grand jury investigating how students were selected for the system’s elite selective-enrollment high schools . . .
Scott, a West Side resident, also had served on the Mayor's 2016 Olympic committee and as former head of the Chicago Park District. In August, he was forced to answer questions about his involvement in a development proposal near the the proposed Douglas Park Olympic site. He insisted he would not profit from the deal. “I would not profit . . . not at all,” Scott told reporters at a Chicago Board of Education press conference. He was responding to a published report contending he was “potentially positioning himself to cash in” if the Olympics come to Chicago because he was helping a group of ministers try to turn some city-owned lots across from what could have been an Olympic site into affordable housing. Chicago eventually lost out to Rio de Janiero, which will host the 2016 Summer Games . . .
Scott owns Michael Scott and Associates, a real estate development firm. West Side Ald. Isaac Carothers (29th) praised Scott on Monday, saying “he was a great individual who added value to every position he served” in city government. Carothers — who was indicted in May for allegedly accepting $40,000 in home improvements, meals and sports tickets from a West Side developer in exchange for zoning changes that netted the developer millions — spent a year secretly recording public officials and real estate developers for the feds, the Sun-Times disclosed earlier this year. On Monday, Carothers cut off a conversation with a reporter when asked whether he had recorded any conversations with Scott. Officials in Country Club Hills said toxicology tests show that Christopher Kelly, once a top adviser and political fundraiser for Gov. Rod Blagojevich, ingested pain-relief medication and rat poison in an apparent suicide in the suburb last month. Mayor Dwight Welch said the test results had been returned to investigators. Police in the town have called Kelly's Sept. 12 death an apparent suicide, saying he ingested pills and the poison in a trailer at his roofing company. Kelly was facing personal turmoil and mounting federal pressure to cooperate in the sweeping corruption case against Blagojevich after pleading guilty in two separate fraud cases. Orlando Jones -- a 52-year-old godson of ex-County Board President John Stroger, former top Stroger aide and married father of two sons -- had lunched with a lawyer Tuesday before disappearing that evening. His body was found about 6:30 p.m. Wednesday at the bottom of a set of steps leading to Gowdy Shores beach, a short drive from a New Buffalo, Mich., casino Jones had frequented. Berrien County law enforcement officials said a handgun was found with Jones, who had a single gunshot wound in his head. Undersheriff Chuck Heit said there was nothing that would lead him to believe "it was anything other than suicide." Authorities recovered notes from Jones' South Loop home, including one referencing how unforgiving the news media tend to be, a law-enforcement source said . . . The discovery of Jones' body came just two days after FBI agents approached Jones, FBI spokesman Frank Bochte said. Jones "cordially declined" to speak with Chicago agents. The FBI wouldn't discuss details of the potential interview, citing an ongoing probe . . . Besides the Las Vegas matter, Jones had been interviewed by federal authorities some time ago about a separate, government-related deal highlighted in a Sun-Times story in Thursday's editions. That deal -- which involved an annual fee paid to Jones by an investment firm that does business with a state government pension fund -- had allowed Jones to be paid six-figure sums annually for a job he did in 2004. Authorities, Stephenson said, wanted to know if now-indicted Highland Park businessman Stuart Levine played any role in helping Jones land the deal. Levine has been indicted along with Wilmette businessman Tony Rezko in a kickback scheme to defraud Illinois taxpayers using fees like the one Jones got. Jones told the feds Levine played no role in Jones landing the fee, Stephenson said. He added that Jones was not asked about Rezko. Like Jones, Rezko is close to the Stroger family, and Rezko and Jones have been business partners, records show. Jones was in County Board President Todd H. Stroger's office as recently as last week. Todd Stroger was elected to the post held by his father, John, last year after the elder Stroger suffered a debilitating stroke. Oh, yes, the Obama-Rezko-Blagojevich-Daley ties run deep in Chicago. The Chicago Way is becoming a pretty deadly business these days. Who will be the next victim? Will U.S. Attorney Patrick Fitzgerald ever get to the bottom of this deep cesspool? That can't happen without removing President Obama from office, along with his top Chicago political advisers, including Rahm Emanuel, Valerie Jarrett and David Axelrod and ending the career of Chicago Mayor Richard Daley and his corrupt city administration.